What's that expression about, if you're going to do something then do it right? 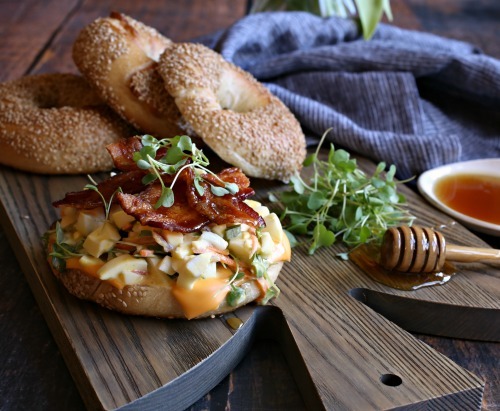 Well, this is a breakfast sandwich done right. More of a weekend project for me but definitely a special Sunday morning treat. Maybe even an amazing brunch for two after a good long sleep. I can't lie and say the most extra special part of this special breakfast isn't the honey bacon. There are over 300 varieties of honey and they each add their own special characteristic to food. And while I love baking with it and just generally drizzling it over all the things, it's especially amazing on cured meats like bacon. It changes our perception of salt and gives that sweet and salty thing that I can't resist. Let's face it, you should probably forget the quantity in the recipe and just go ahead and cook up the whole package. Trust me, there won't be any leftovers. 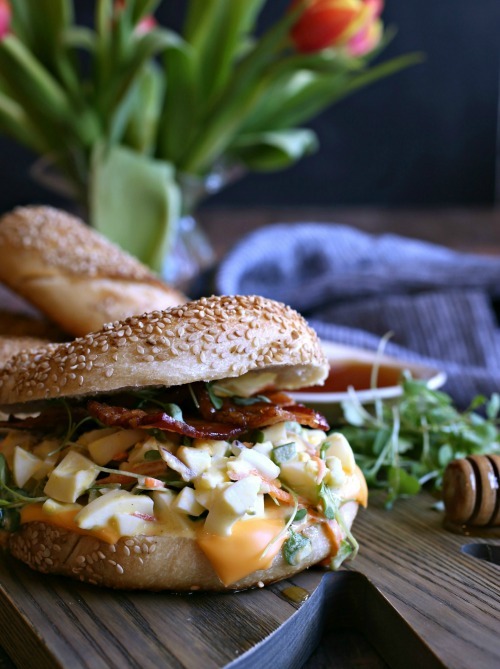 The loaded egg salad is my nod to a veggie omelet. I love how the crunch of the carrots and bell peppers contrast with the creamy dressing and the tang of a drop of mustard. And yes, you might want to make an extra couple of eggs here, too, because you will stand there and eat this with a spoon. Place the bacon on a rack set over a baking sheet lined with aluminum foil. Drizzle with the honey and place in the oven for 15 - 20 minutes or until crispy. Bring a large pot of water to a boil and add the eggs. Cook on high for 10 minutes and then run under cold water to stop the cooking. Allow to sit in the cold water until cool enough to handle and then peel and chop into small pieces. Combine the mayonnaise and mustard in a bowl and add the chopped eggs, red onion, bell pepper, shredded carrots and parsley or micro greens. Stir just until combined and season with salt and pepper to taste. 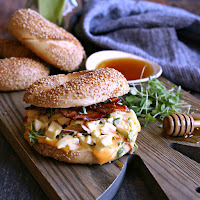 To assemble the sandwich, lightly toast the bagels and place one slice of cheese on each bottom half. 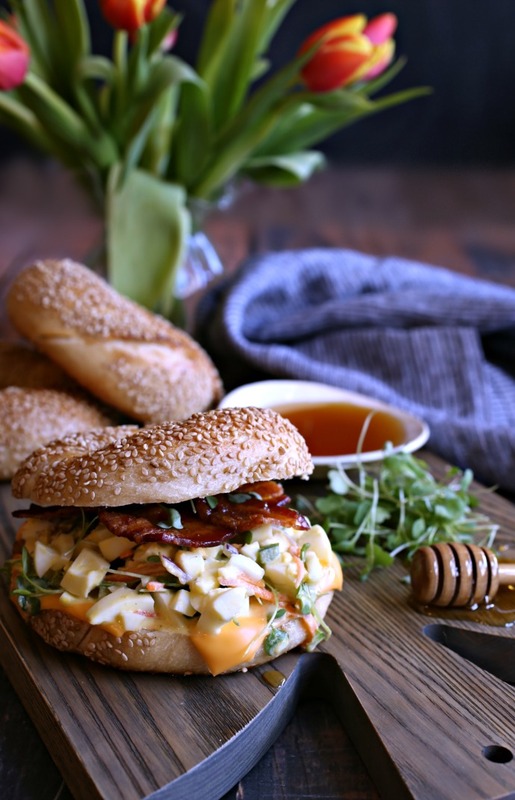 Top with the egg salad and honey bacon. For more information about honey, as well as recipes made with honey, visit the National Honey Board at honey.com and check out their Facebook, Pinterest, Twitter, Instagram and YouTube pages. This is a seriously gorgeous sandwich. And I'm loving the sound of that bacon!